Home / Shop / Solar Hot Water Heaters / Solar Hot Water Accessories / Pre-Insulated Solar Line Set / Basic Pre Insulated Solar Line Set / FlowMaxx 3/4 in Pre Insulated Line Set with mounting clips – 40 ft.
FlowMaxx 3/4 in Pre Insulated Line Set with mounting clips – 40 ft.
SKU: FlowMaxx-IDL-34IN-13MM-40FT-M. Category: Basic Pre Insulated Solar Line Set. The FlowMaxx system has been specifically designed to make solar thermal installations easier than ever! This Innovative design has brought us a single flexible line set which includes top performing insulation, a solar flow loop, a solar return loop, and a sensor line all included in one, easy-to-install product. By integrating the Solar Flow Loop, Solar Return Loop, and Sensor line all into the same line this product is designed to make solar thermal installations as easy and efficient as possible. 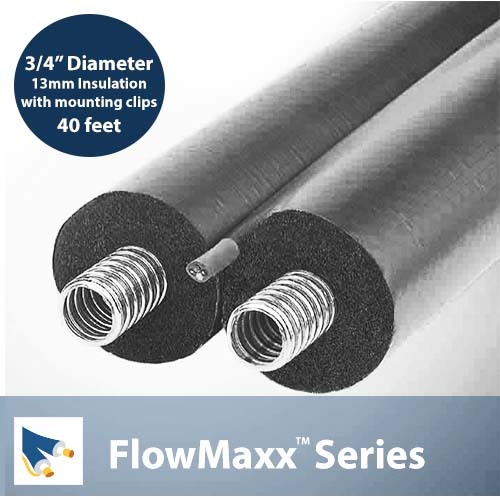 All line sets require our FlowMaxx quick connects for connecting to additional piping, tanks, or collectors.